The AFP Cat Love Food Bowl for Cats is a fun food bowl in bright colours. The bowl is made from durable plastic and has an anti-slip bottom. The playful motif on the food bowl is on the inside and on the outside of the bowl. Available in pink and blue. 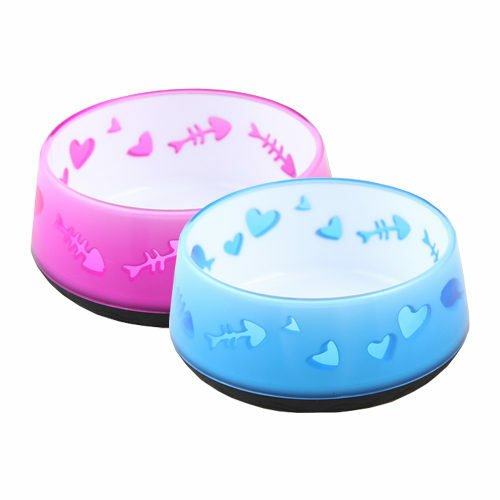 The Cat Love Food Bowl from All for Paws is a cute bowl to put your cat's food or water into. It is made from durable plastic and has a fun motif on the inside and on the outside. The base of the bowl has a rubber layer, which stops it from sliding around when the cat uses the food bowl. An added benefit of the All For Paws Cat Love Bowl is that it is easy to clean. Have you used AFP Cat Love Food Bowl before? Let us know what you think about this product.